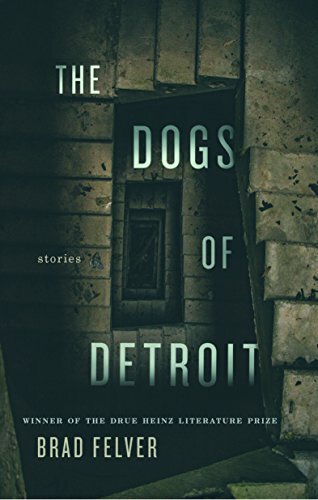 Brad Felver’s outstanding debut collection of stories, The Dogs of Detroit, is populated with characters consumed by grief and pain who are unable to escape their personal and geographical history. Felver delivers these 14 stories, which won the 2018 Drue Heinz Literature Prize, with writing that is both sharp and hypnotic so that even when you want to turn away, to look away, you can’t. These stories inhabit a landscape that is frequently brutal and unforgiving, a landscape that regularly upstages the characters, which is no easy task. Felver’s stories chronicle lives of despair and desolation that eventually deteriorate into violence or isolation. Still, while the stories explore a world overwhelmed with loss, scarcity, financial stress, emotional bankruptcy they also exhibit an odd sense of resilience in their ability to keep going. In other instances, their fighting produces a strange closeness—as if their punches create a connection. Characters fight with each other to gain temporary relief from their own pain and a distraction from their other bruises—both inside and out. In “Unicorn Stew” the narrator and his best friend hit each other over and over and bruise each other in order to overlook and camouflage bruises they received from a parent or a bully. Estranged brothers meet up accidentally at an airport bar in “Hide-and-Seek.” When their small talk and lies give way to memories of their brother who died when they were young, the narrator gradually realizes that the loss of their sibling was equally painful for them both. The title story is a particularly dark apocalyptic tale about a young boy who has lost his mother. At one point, the “father reaches for Polk’s hand, but Polk pulls away. No touching unless it is to create violence.” Like many of the other stories, Polk and his father are stuck and unable to move past their grief. In The Dogs of Detroit Felver has created a dark mirror for readers to gaze into.